I’ve been exploring my home state of Vermont since before I could walk, but I didn’t start hiking in earnest until I hit my late teens. My very first “real” hike (for me, that’s more than 3 miles) was a trek up Camel’s Hump in old sneakers, which didn’t end well. I’ve learned a few things since then (thank goodness), and am now the proud owner of several pairs of hiking boots. For the past few years, the trails we’ve conquered have been more of delightful meanderings, challenging our senses, but not necessarily our muscles. We’ve been all about hidden waterfalls, peaceful woodlands, and secret swimming holes, and while peak bagging is awesome, we just haven’t made it a priority. 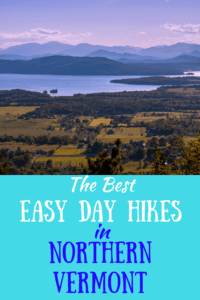 The following northern Vermont hiking trails are easy enough for families with kids, but they’re dog and parent-friendly too. Vermont’s largest city wholeheartedly embraces the outdoors. There are dozens of parks, several paved bike trails, and numerous places to swim in Lake Champlain. Is it any wonder that it is consistently rated one of the healthiest cities in America? 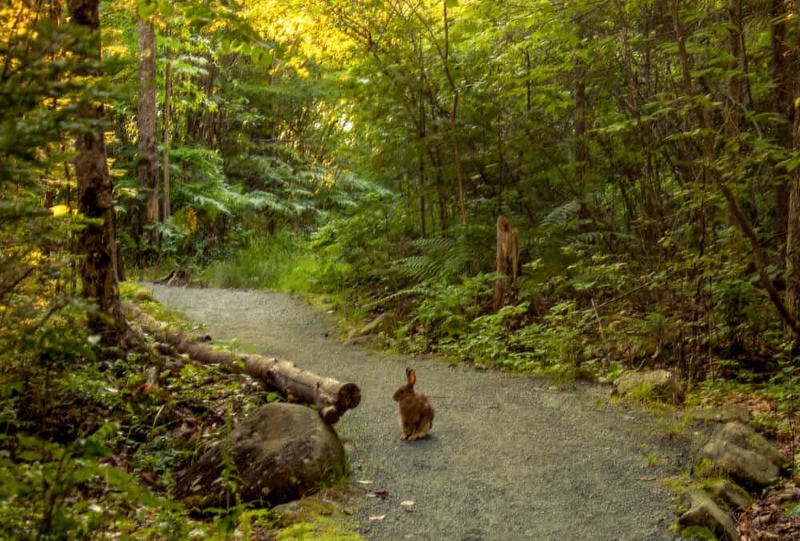 There are so many cool spots and hiking trails near Burlington, but these are our favorites. When I was a kid, Red Rocks used to be the place where the bad boys jumped off cliffs into Lake Champlain. I’m sure that’s still going on, but for me, the real treasure of Red Rocks is the Lake Trail, which meanders along many of the aforementioned cliffs, providing unparalleled views of the Adirondacks and Lake Champlain. The path is mostly hard-packed gravel, and there are barriers between the trail and the edge of the cliffs for safety. This is an easy walk that will take you about an hour, depending on how motivated you and your kids are. If you want to do a little more exploring beyond the Lake Trail, my kiddos recommend a climb on the Lichen Ledges and a swim at the public beach before calling it a day. Difficulty level: Easy-peasy – perfect for all ages! Length of trail: About a mile (one way) if you have to walk in from the street (winter). It’s closer to 0.6 of a mile if you park in the lot (summer). Dogs: Must be kept on a 6-foot leash. Lots of dogs walk here. For directions and a printable trail map, visit the South Burlington Recreation & Parks website. Mt. Philo is a great hike near Burlington. Mt. Philo is definitely one of our all-time favorite places to watch the sunset over Lake Champlain. I wrote a bit about Mt. 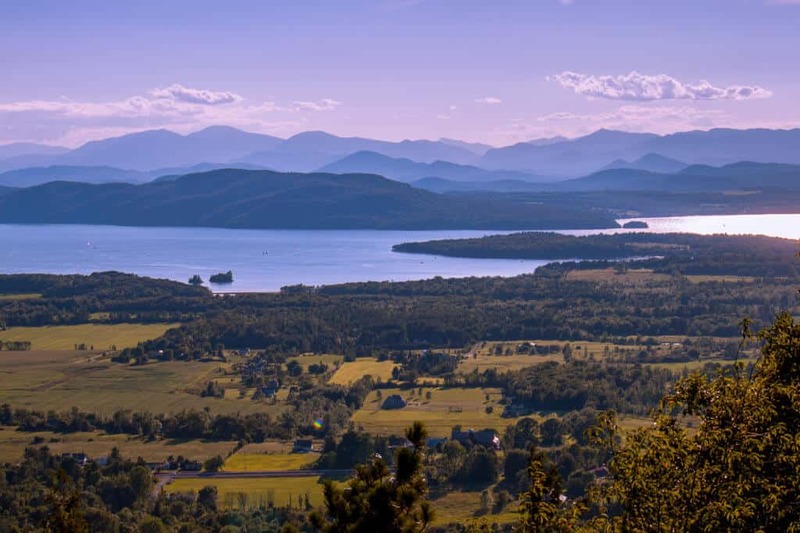 Philo in this post about exploring the Lake Champlain Valley. I have to be honest though, we usually drive up to the top of the mountain, mainly because we’re carting along the perfect sunset picnic. I’m including Mt. Philo on this Vermont hiking list, though, because it was my absolute favorite hike to take with my grandparents when I was a kid. The trail from the parking lot to the summit is ¾ of a mile. It’s an uphill climb the whole way, and the whole world opens up when you get to the top. I think I loved this hike so much as a kid because it really felt like I had accomplished something when I got to the top. Difficulty level: Hard, but short. I think 10-year-olds would love it! Length of trail: ¾ mile one way. Additional information: During the open season (Memorial Day to Columbus Day), you’ll find restrooms at the top. There’s also a charmingly quiet campground. I love camping here and waking up in time for the sunrise. For a campground/trail map, visit Vermont State Parks. 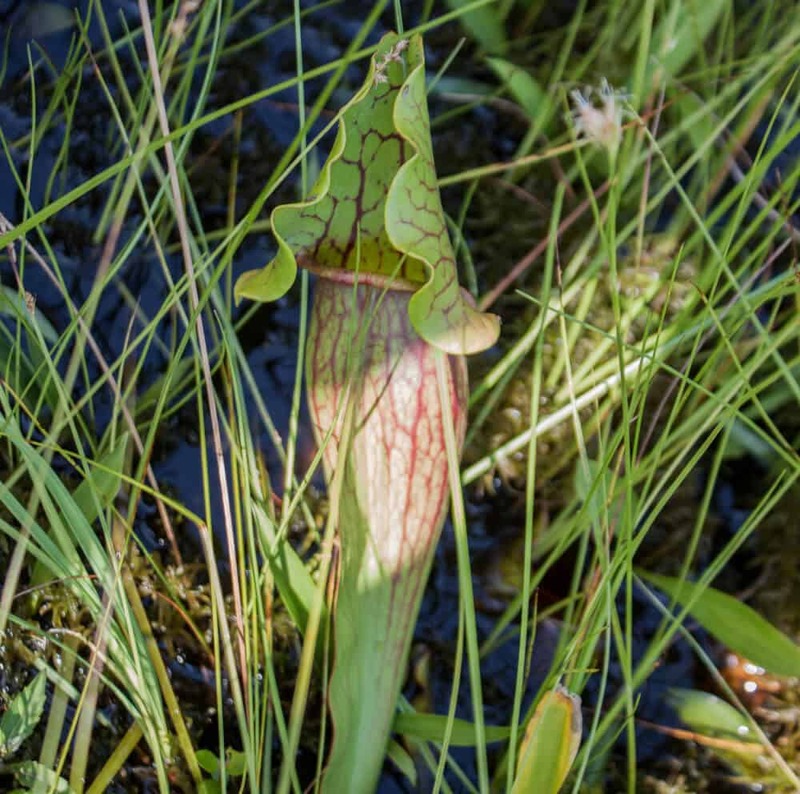 The deadly pitcher plant in Colchester Bog near Burlington. Airport Park in Colchester is a good starting point for all kinds of outdoor adventures. Jogging paths, rec fields, playground equipment, and restrooms make this a favorite after-school park throughout the year. You can also access the Colchester Causeway for a nice flat bike ride along Lake Champlain. Our favorite discovery within Airport Park is Colchester Bog, where you’ll find some of the coolest plants in all of Vermont. A boardwalk delves deep into the bog, making it easy for kids to get up close and personal with this unique ecosystem. You’ll swampy forests here, as well as some open peat bogs, and dense thickets of shrubs. Please stay on the boardwalk to protect this fragile community. Difficulty: So easy and short that you’ll want to combine this trip with a playground-visit or bike ride. Dogs: Not sure, but if you do bring dogs, be sure to keep them on the boardwalk. I couldn’t find a trail map, probably because the trail is so short, but you can read a bit more about Colchester Bog on the UVM website. I fell in love with Niquette Bay State Park because the trails are so dog-friendly. Unfortunately, dogs are no longer permitted to wander around off-leash when the park is open (May 6th to Columbus Day). You’ll still find plenty of happy dogs in the park, though, and dogs can still swim at Calm Cove. 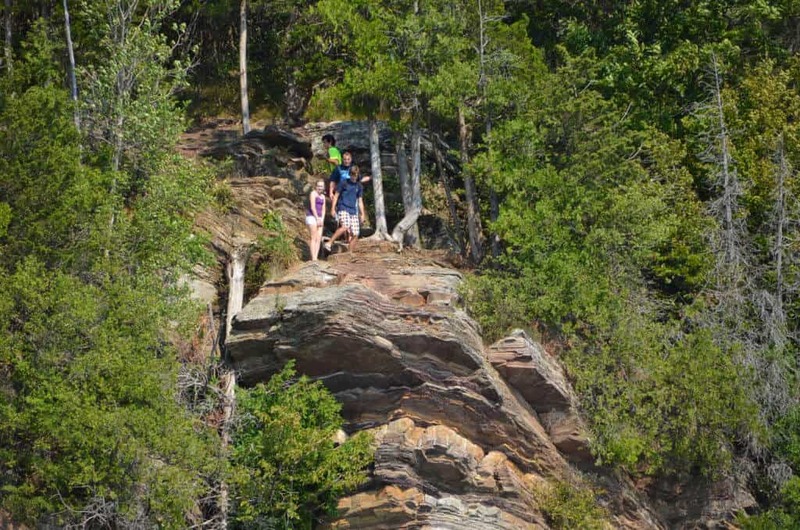 There are all kinds of trails at Niquette Bay State Park, ranging in length and difficulty, so whether you’re hiking with toddlers or teens, you’ll find a trail that’s perfect for your adventure. My favorite is the Muhley Trail to the Island View Trail (views!! ), back to the Muhley Trail to Calm Cove for a swim and back to the parking lot via Burns Trail (easier) or Ledges Trail (more difficult). Difficulty: Varies – Littles can take Allen Trail straight to the beach. Older kids will enjoy the hike mentioned above. Dogs: Yes, but keep them on a leash during the open season. For more information, including directions, check out Vermont State Parks. There is some amazing hiking opportunities in the Green Mountains, but many of the trails are difficult and discouraging for kids. All of the hikes in this section are easy enough for elementary schoolers, as long as you’re mindful of steep drops near waterfalls and on top of mountains. Hiking the ridge of Mt. Mansfield in Stowe. There is no easy way to hike up Mt. Mansfield with young kids, but if you’re willing to cheat a little, you can get a good hike in after driving the Stowe Mountain Resort Auto Toll Road, which allows you to drive to Mt. Mansfield’s nose and hike on the Long Trail to the Chin. Basically, you’re hiking along the ridge of Mt. Mansfield with incredible views in every direction. From here you can see Lake Champlain, the Adirondacks in New York, the White Mountains in New Hampshire, and Canada. There are very few trees, lots of boulders, and steep drops. The wind is fierce up here, and you’ll be hiking through rare alpine tundra, so be sure to stay on the trail. You’ll find lots of spots for picnicking and relaxing, so give yourself several hours for the drive/hike. Dogs: Must be kept on a short leash to protect the delicate alpine flora. Need a trail map? Visit Vermont State Parks. Bingham Falls can be reached from an easy trail in Stowe. I think Bingham Falls is the prettiest Vermont waterfall. Anyone want to disagree with me? Please leave me a comment – I’d love to check out some rival falls. Bingham Falls starts as a series of cascades through a narrow gorge of potholes. The main waterfall is a 30-foot cascade, plunging into a lovely round pool of frigid water. The hike to Bingham Falls is an easy one, heading gently downhill until you reach the top of the falls at about 0.2 miles. From the top of the falls you can either head upstream, where you’ll find several small swimming holes, or downstream for an unobstructed view of Bingham Falls. This is a busy trail during the summer and fall, especially on weekends. The rest of the year, you may just have the whole trail to yourself. Distance: 0.2 miles to the falls, additional hiking on Mill Trail, which heads south along the river for about .75 miles. Dogs: Yes. I don’t know the specific rules, but we saw several dogs off-leash when we were there. The Bingham Falls parking lot and the trailhead is located right near Smugglers Notch State Park on the Mountain Road (route 108) in Stowe. 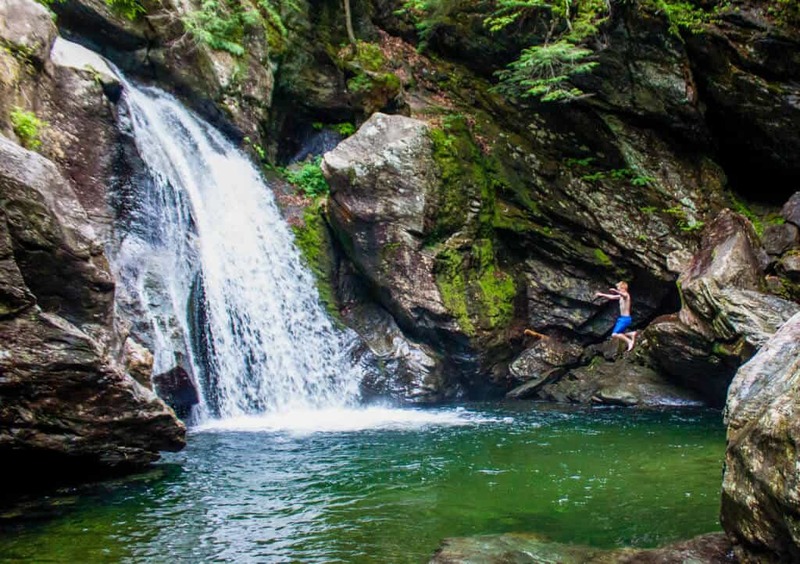 Yep — Stowe gets Vermont’s tallest mountain and two of its loveliest waterfalls. 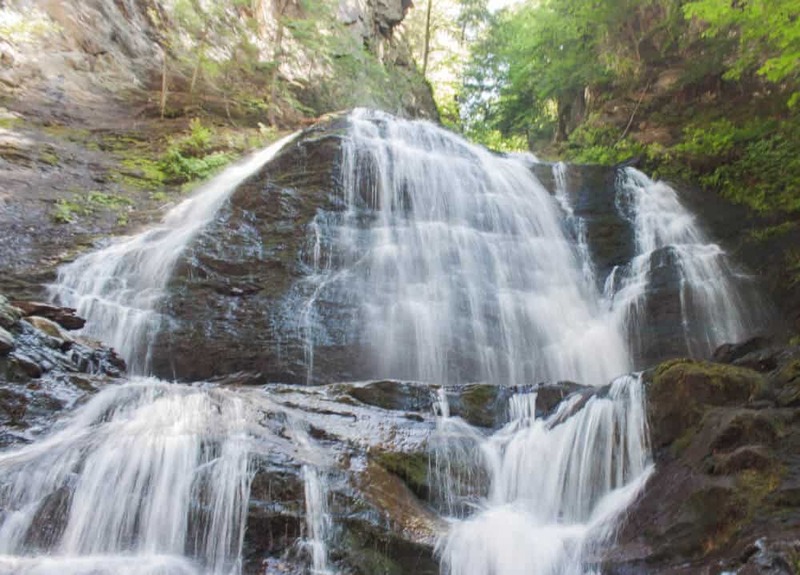 Moss Glen Falls in Stowe (not to be confused with Moss Glenn Falls in Granville) is another really easy hike for kids of all ages. From the parking lot, the hike is a short 0.2 miles to the upper viewpoint, where you’ll get a nice view of the upper falls. Head down to the lower viewpoint to get up close and personal with the falls. Kids will find several spots in the river to get wet if the weather calls for it. Distance: 0.3 miles to the falls, but you can keep hiking past the falls through the woods for another mile or so. Dogs: Yes, but I’m not sure of the leash laws. For directions, visit the Northeast Waterfalls website. The view from Owl’s Head in Groton State Forest. 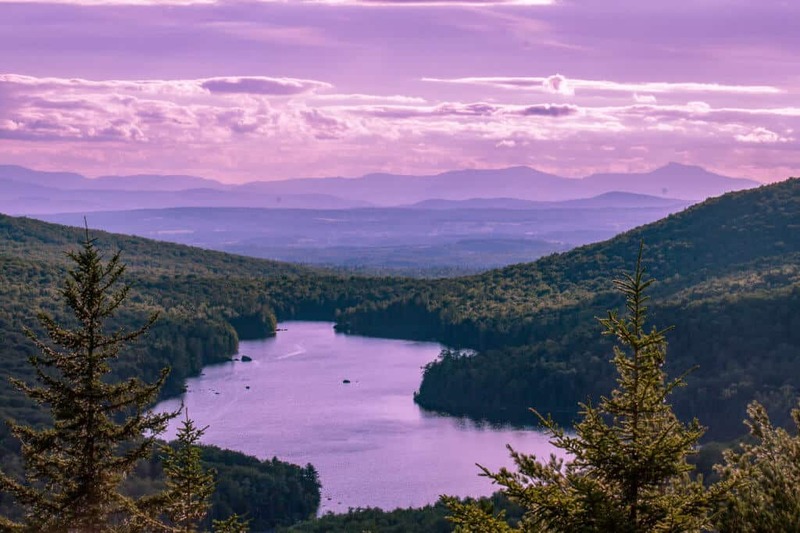 Groton State Forest is such a wild and beautiful part of Vermont, and there are all kinds of hiking opportunities for families, not to mention ponds and lakes for swimming, paddling, and fishing, a super awesome rail trail, and some nice mountain biking trail. 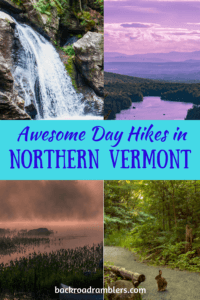 If you are looking for a wild Vermont vacation, this is where you should go! Groton State Forest is home to seven unique state parks, so you’ll never run out of outdoor adventure opportunities. I wrote a whole post on Groton State Forest over the summer, so maybe I should stop gushing here. Our favorite hikes are also detailed in that post, so please check it out for more info. I will list them here just for reference. Difficulty: moderate and probably better for older kids (10+). If you’re hiking with younger kids, you can drive up the mountain, and hike a very short trail to the summit. Difficulty: Easy – it’s a nice flat trail, but the loop is 4.5 miles, which might be difficult for small children. Difficulty: Moderate, only because the trail is strewn with boulders, and very young children might find the hiking frustrating. You can find a bit about these Groton State Forest trails in my aforementioned blog post above. Here’s a link to a Groton State Forest trail map. I know there are many, many more trails to discover in northern Vermont. And it may just take us a lifetime to explore them all. 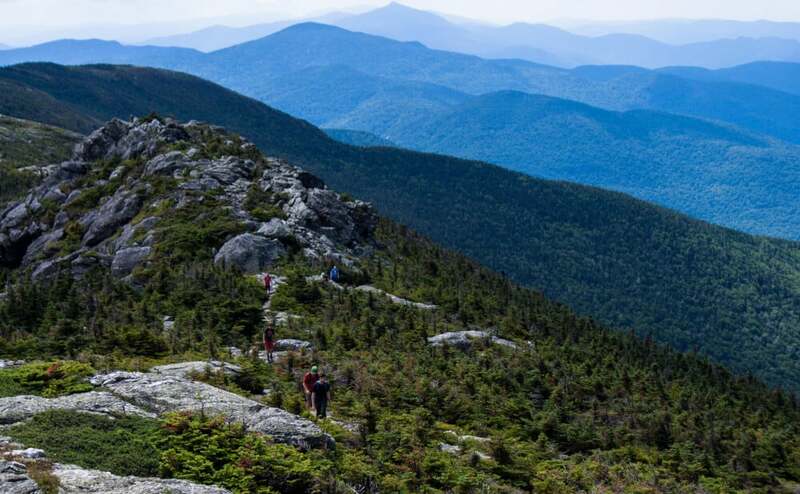 Do you have any Vermont hiking trails you can recommend for families? I’d love to hear about them in the comments below. I agree, Carol. I am originally from Newport, and am always trying to find a way back to the NEK. Eagle Mountain in Milton has easy hikes and an outlook on Lake Champlain (no guard rail). Dog friendly-please protect nearby springs by picking up after your pet. It is a town park. Hiking trails along the Brewster River in Cambridge off Canyon Road. Park on the west side of the covered bridge. The trail starts on the east side and leads to “Jeff Falls” and beyond. Thank you so much for chiming in, Patricia! I can’t wait to check these out. I have never done any hiking in Milton and I love Jeff Falls! Reminds me of Portland, Oregon. Looks like so many great options for hiking. Moss Glenn Falls would be my first choice!